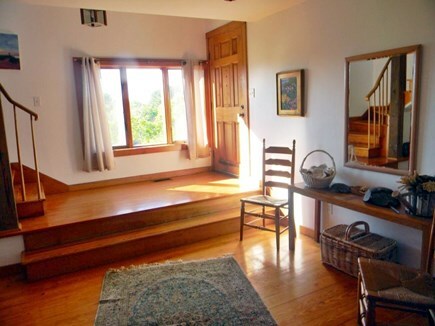 The loft of this upside down home leads to a widow's walk with a fabulous view of Hummock Pond and the ocean and the extensive moor. You can actually see the steeple of the Congregational Church in town 2 1/2 miles away. 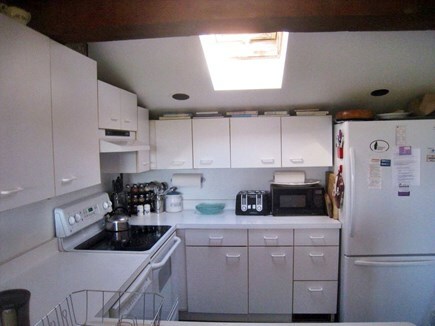 The house features 4 bedrooms + a loft with a double futon, along with 2 1/2 bathrooms. The sleeping loft is accessed via a ladder from the living/dining room. On the first floor, there are three bedrooms, one with a queen size bed and a fireplace and the other two with twin beds. 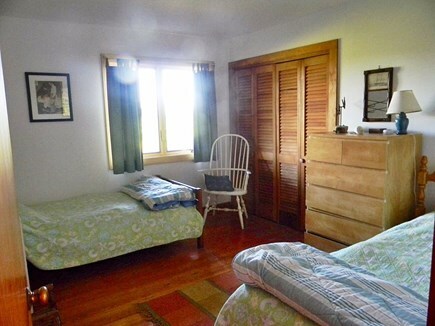 The master bedroom is on the second floor and has a queen-size bed. There is a jacuzzi opposite the master bedroom on the second floor. There is a fieldstone fireplace in the living room that reaches up to a cathedral ceiling. There is a library with some 100 books that relate in some way to Nantucket. A deck runs the full length of the front of the house. 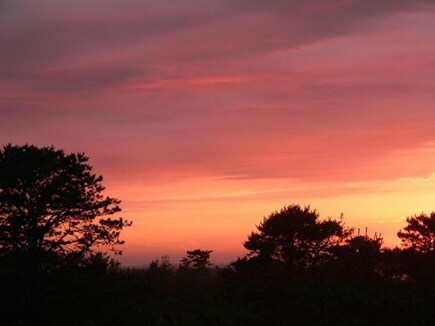 From the deck you’ll see unobstructed, stunning views over the moor to the ocean (worth seeing it with a mist over the moor). The morning sun follows a gorgeous sunrise and floods the deck, providing an ideal place for breakfast. The view of the sky is also spectacular due to the ability to see so much more of it from the flat terrain. At night you can lie in bed and hear the surf pounding on the beach. Enjoy the deck on the back side of the house and view spectacular sunsets. The beach is a 5-10-minute walk down an unsurfaced road. There is also a lifeguarded beach close by if you prefer that. Two bikes available at the house will get you to the beach in a couple of minutes. 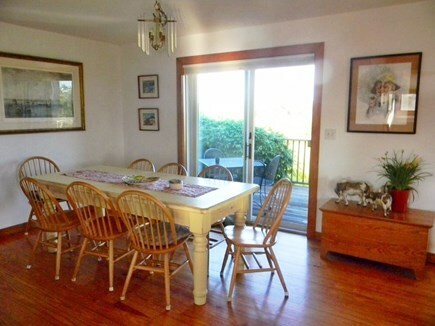 Nearby is Bartlett Farm with fresh vegetables and all that you would need for any type of meal. Their tomatoes are worth a trip there alone! Also close by is a fish store with the absolute freshest fish you would find anywhere. As if that is not enough, Cisco brewery provides tours of the facility where they describe their process of brewing the beer and end with beer tasting of their many beers. They also make very high class whiskey and vodka. A different band plays there every day and the atmosphere is festive, particularly at the end of the beach day. One can easily avoid going into the busy town. Wow! Like No Other Place on Earth! 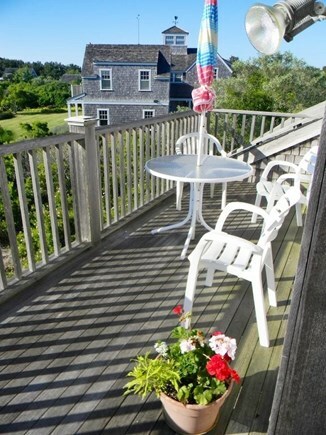 We had a absolutely wonderful stay at “Moor-Vu” on Nantucket Island. The house is quite beautiful and the ocean can be seen from most of the windows around the house and from the double porch decks. Everything is meticulously appointed and the master bedroom is a dream come true. I know this sounds dramatic, but my entire family will back me up on this. The house has everything one needs. 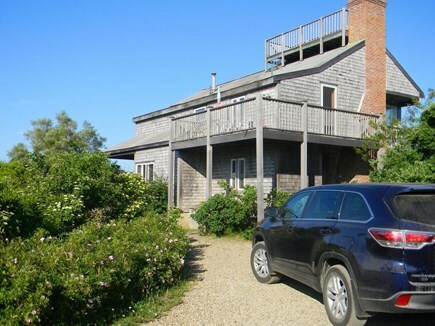 It feels very private and looks out over acres of wonderful marshland and ocean. 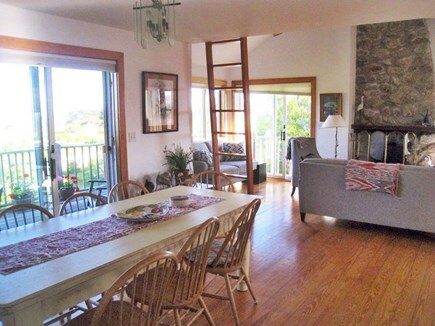 The living room and fireplace were delightful locations for reading, playing board games and enjoying the vista. Bike and car paths take you wherever you need to go. My 10 year old daughter loved climbing the stairs to the loft (and sleeping up there), then heading up with us to the roof-deck which is safe and thrilling. A marvelous view, way up high. We could easily walk or ride the bikes (provided for the guests of Moor-Vu) to the beach in no-time at all. What greets you there is surf and sand that seems to go on forever. Finally, we found the owners to be friendly and reachable by phone, though we had everything we needed. This is a home one can return to and fall in love with nature all over again. We loved it! be sure to secure an early reservation to vacation at MOOR-VU located at One Austine Locke Way. No words are sufficient to capture the joy I experienced on this my maiden voyage to MOOR-VU! So understated in its pristine setting off an unpaved dirt road, only a short distance from Cisco Beach, MOOR-VU commands unobstructed views over the moors to the crystal blue waters beyond! Deliriously happy my two days there, my guest quarters appointments left nothing to be desired. 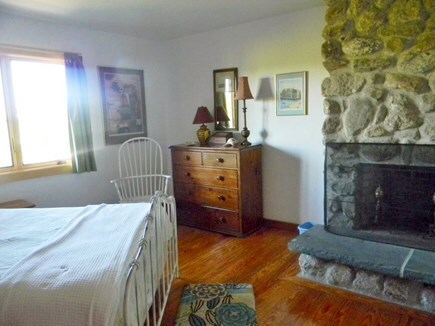 My hosts put me up in a large bedroom replete with timeless artwork adorning the walls, and a robust fieldstone fireplace! My bed linen was clean, fresh, and the Ralph Lauren pillows were just the best! From my room I drifted off to sleep, cradled in the ocean breezes wafting through my window. 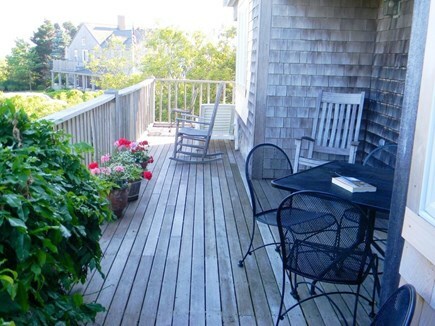 I spent a fair amount of time with my hosts on the upstairs seaward deck over early morning coffee and good conversation. My last night it rained, enveloping the moors in a cloud of mist under a dark moonlit canopy. The house is beautiful with everything you need. It is large enough for a group to come and each have sufficient space (large bedrooms) but also has a beautiful living room and dining area for folks to get together. 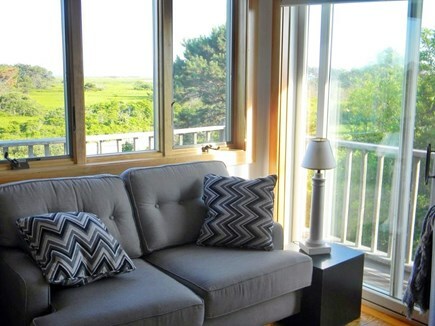 The porches look out on conservation land so you always have a view, no houses in the way. It is really peaceful and you really have the sense of being away - but still a short walk to the beach. .
A group of us have been renting the house of a long weekend every fall for many years and look forward to it each year. We almost never leave, and if we do it's only to go to Bartlett farms or a nearby fresh fish store to get provisions for our meals. 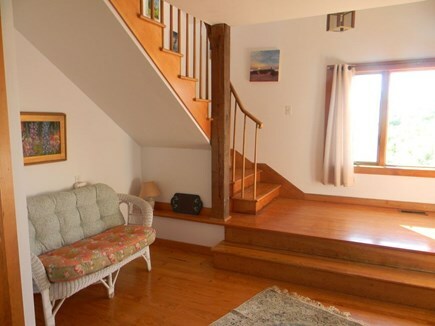 It's only a short bike ride or drive from Nantucket town but you might just want to hang out in the house as we do. 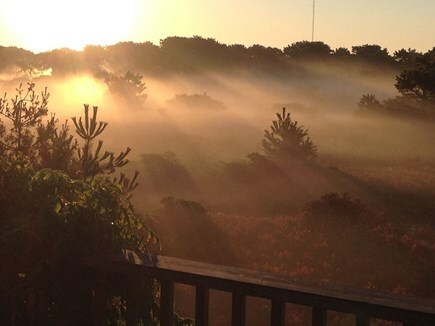 This is a perfect weekend getaway from NYC. You can rent a car at the airport or even bike around since there is a brand new bike path from the house that branches to town and elsewhere on the island. 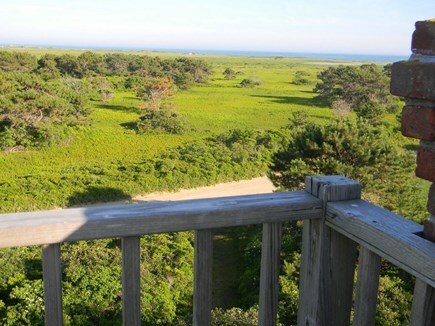 The house is located on conservation moor land with a view of Cisco Beach. The beach is a quiet 5 minute walk down a private road. It is well equipped with a private master bedroom upstairs that is separated from the other 4 bedrooms downstairs. The space is lofty, yet cozy and everything was in nice shape when we arrived.